I've been staring at this screen for a while now. I wanted to write about competitions, deadlines, Scriptfrenzy, but just like the rest of my week, I'm struggling to find the motivation. 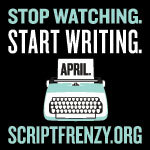 Scriptfrenzy is a challenge to write a 100 page script in 30days. The winner is anyone who completes the challenge, and the prize is oodles of satisfaction, or whatever you aim to get out of it. I just want to feel the sense of achievement. It sets a timeframe and I work better to deadlines. I have dozens of ideas for scripts and other projects in my head but they get created faster and possibly better when I'm working under the pressure of a deadline. The first script I ever wrote was for a competition and the last script I've completed was also for a competition. I realise these are not the only way of getting a script out there and read, but to me they are a way of getting it done. Winning would of course be great, but having a completed draft that I can work on and improve in the long run is also a win. When I therefore heard about Scriptfrenzy I signed up. This to me will hopefully be a great opportunity to get that one script I've been toying with for years done. The said script started off as a novel about 5yrs ago, I then decided that it would work best as a script, but have been adding and tweaking and messing with the outline for at least half a year now and it's going nowhere. Earlier in the week I decided I no longer wanted to work on it and would do something completely different. Five days on and about 4 different ideas and genres later and I'm back to the original script, a drama. I've come to realise that no matter what I decide to go with, there will always be that part of me that will try to find an excuse not to do it, just like going to the gym. It's a struggle to get there, but the buzz and feel good factor during and after makes you wonder why it was so hard to get there in the first place. I realise that I could simply give myself a time frame to complete a script, just like this challenge, but it just wouldn't be the same. With Scriptfrenzy I have buddies also taking part, all supposedly writing at the same time. We'll be able to motivate each other by doing it together, keeping an eye on each other's development and entering a healthy page count competition. And now that the word competition has become part of it, I'm game. So with no more excuses, I have one week to go over the outline and then let the writing commence.